I hate to sound like a broken record, but for years I have been warning directors to do thorough research about the organizer(s) before sending their contestants to a "new" pageant. 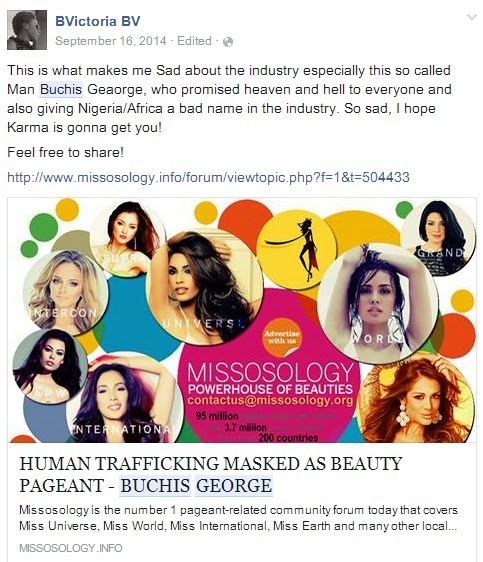 The "Face Of World 2013" scandal should serve as ample warning to naive individuals, but it seems that this warning is falling on deaf ears as we see that Buchi is back in business and reining in new victims. 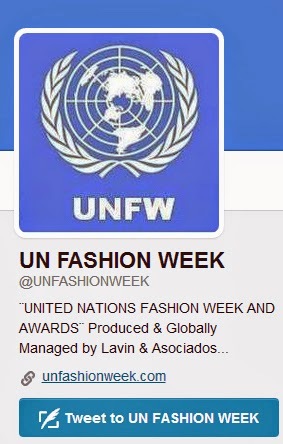 His latest international event: the United Nations Fashion Week (UNFW) to be held in New York City's Waldorf Astoria Hotel and Resort from October 20 to 26, 2015. 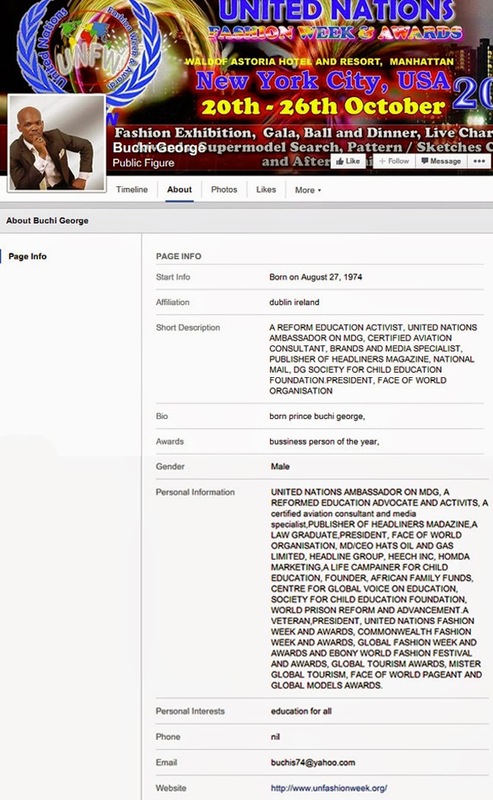 Below is a screenshot of Buchi's Facebook "Public Figure" page (his old one - under "George Buchi Nwabueze" - had been deleted). Notice that the new one uses "Buchi George" instead of "Buchis George." Buchi's seems to suffer from delusions of grandeur, as suggested by his questionable "résumé" on his Page Info. For someone who is supposed to be well-educated ("a law graduate student"), he does not mention the educational institutions that he has attended (that is, if ever attended any). And for someone who claims to be a "reformed education advocate," he can't even spell the words "business" and "activist" correctly. "He approached me in 2013 to help him with a competition he was going to do here is SA. After working on the event for quite a while I realized that he was a fraud. 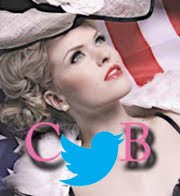 I contacted the venues he was advertising and none had any bookings from him, merely only inquiries, so I insisted that before I continue to help he pay me for my time already spent which, of course, I knew by then was not going to happen. Apparently he had gone to see Alex Liu in Singapore about being his Head Judge for the event. When I then exposed him, he blocked me on Facebook which suited me very well as I could then do a few more posts about him. I tried to contact all the contestants to warn them not to come to SA and that I believed it would be a scam, however a few did come. I received a frantic call from the contestants and some directors asking me to go and rescue the contestants as they were being held 'captive' in some grimy hotel in the worst possible area in SA - Hillbrow. I do not know of any South African that actually even ventures to drive within 500 meters of the area and it is crawling with illegal immigrants, drugs, prostitutes and everything that no right-minded person would be involved in. I gave the people the police telephone number and from what I can gather they managed to escape to the police station and George was arrested. I have no idea what happened after then as I believe that his Facebook page was silent for many months; however, I did notice that he has again started his con as someone emailed me to ask about him. Of course. I exposed him but more I cannot do." How exactly did Edgar Sulit get involved with Buchi? Enter Ovette Ricalde (real name: Lamberto Ricalde) a Filipino who passes himself as the "managing director, international pageant director, and pageant consultant" at MegaStar Production based in the Philippines. Ovette himself had engaged in some shady business in the past (and continues to do so). He has a long history of "crowning" winners who can afford to pay their own way to their respective pageants. 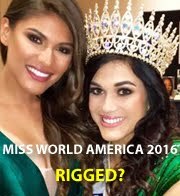 For example, he sent a young woman by the name of Princess Ramos to Miss Globe International 2014 in Azerbaijan, but it was Princess herself who paid for her own airfare and the franchise fee. However, the Philippine delegate to the 2014 Face of Beauty International pageant held in Taiwan last November - a deaf-mute teenage girl from a poor family named Princess Alanis Pura - could not compete because she could not afford the airfare. Rumor has it that the only reason Ovette had chosen her as the representative was to gain publicity by exploiting her handicap. On his Facebook page, Ovette Ricalde promotes himself as the "Mother Of All Pageants" because he believes he owns the most number of pageant franchises in the Philippines. June 9, 2014 - Edgar sends Buchi a copy of a letter written by Edgar - dated June 9, 2014 - and addressed to the Canadian Embassy in Abuja, Nigeria requesting the Embassy to secure a Canadian visitor’s visa for Buchi so he could be the "special guest" and "celebrity judge" at the 2014 Mister Global Tourism Canada and 2014 Miss United Continents Canada to be held at St. Cyril and Methody Hall in Toronto on July 12, 2014. 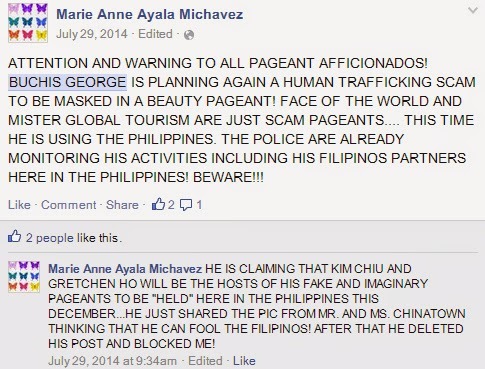 July 18, 2014 - Buchi writes to Ovette inviting him "to be part of 2014 Mister Global Tourism and Face of World pageant in Manila, Philippines." (Side note: Buchi's English is rather mediocre with plenty of misspelled words, faulty syntax and run-on sentences, so for the benefit of clarity, I have purposely edited and corrected his written English). Buchi then explains his side of the story (what exactly happened in South Africa). July 21, 2014 - Buchi sends a letter (in JPEG format) to Edgar officially appointing him as Face of World Organization's "vice-president of administrations and franchising." Edgar's responsibility would be to lead FWO's administration office in Canada, to be the "vice-global coordinator" of Global Family Funds (the charity and humanitarian arm of FWO), and that he would be entitled to "25% of proceeds of profits" of all of FWO's business dealings. August 14, 2014 - Buchi asks Edgar to send him a budget proposal. Buchi promises Edgar that he will send money to pay for all the expenses. 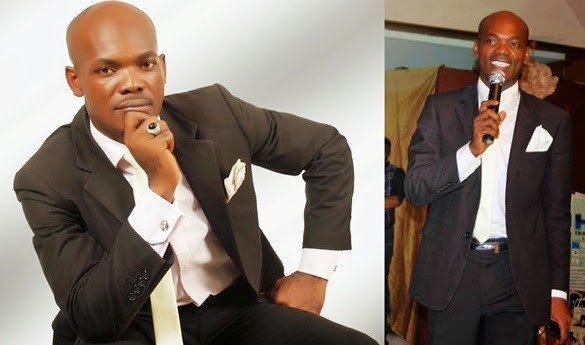 Edgar advises Buchi that he will reimburse him after the pageant in Toronto. August 18, 2014 - Edgar sends Buchi a copy of the agreement between Edgar's company (IPEN) and Westin Harbour Castle Toronto where the pageant would be held. September 2, 2014 - Edgar sends two documents to Buchi: 1) a contract ("Memorandum of Agreement") between his company (IPEN) and Buchi's (FWO). The contract lays out the respective obligations of each party; and 2) a copy of a letter written by Edgar - dated September 1, 2014 - and addressed to the Canadian Embassy in Abuja, Nigeria requesting the Embassy to secure a Canadian visitor’s visa for Buchi so he could be the "special guest of honour" at the Toronto pageant. 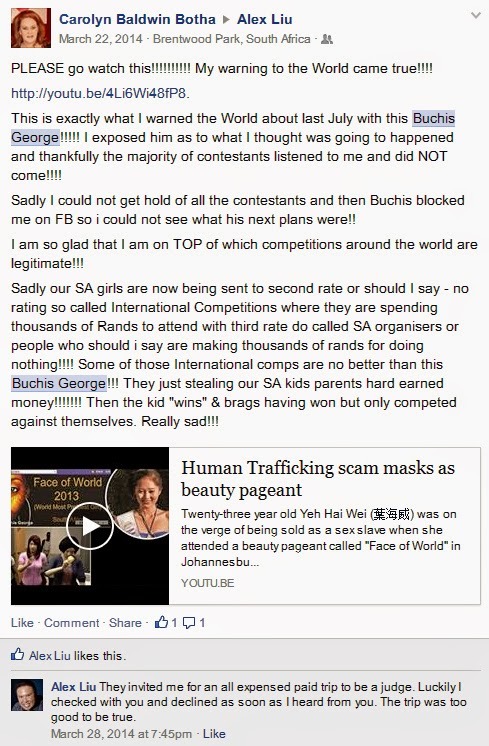 Buchi failed in fulfilling his obligations to Edgar, which prompted Edgar to ask Buchi to take down all of Edgar's contact information from Buchi's multiple fake pageant websites, and to end all communications with him. That was two months ago. 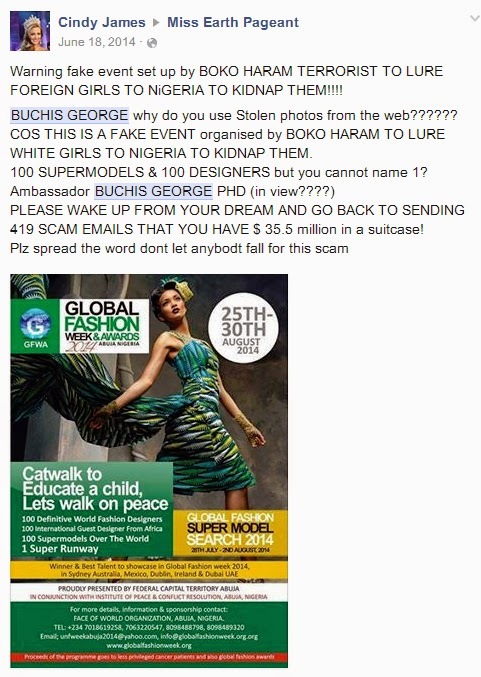 Meanwhile, Buchi blocked Edgar on Facebook and continues to promote fake events. His latest one is the UNFW event. Buchi - along with his equally shady Filipino associate Ovette Ricalde - are currently promoting the UNFW event on social network. Now that Edgar is out of the picture, Buchi and Ovette found another potential benefactor to help them coordinate the event in the United States. Enter Danny Pagsambugan, the founding president of Maharlikang Pilipino USA (MPU) which used to produce fashion shows and pageants for the Filipino community in the East Coast. Danny started communicating with Buchi via Ovette last December 2014. Danny met Ovette in Manila during the last week of January 2015; the two struck a friendship. Danny is undoubtedly one of the dearest people I know in the pageant industry; he is also kind, generous, and honest and he is always willing to lend a helping hand to anyone in need, so when the opportunity arose for Ovette to find someone from America to help him organize the UNFW event, he approached Danny who subsequently obliged. A third person, Collins Sam Guvai, a citizen of Kenya who refers to himself as the "executive board secretary at United Nations Fashion Week-UNFW" on his Facebook page, is also involved in the running of the event. But since neither Buchi nor Collins has any registered business in the United States, Danny took the liberty to register the event under his name. Danny also wrote letters to the U.S. embassies in Nigeria and Kenya requesting them to issue a visitor's visa for Buchi and Collins respectively so they could attend the event in New York City. 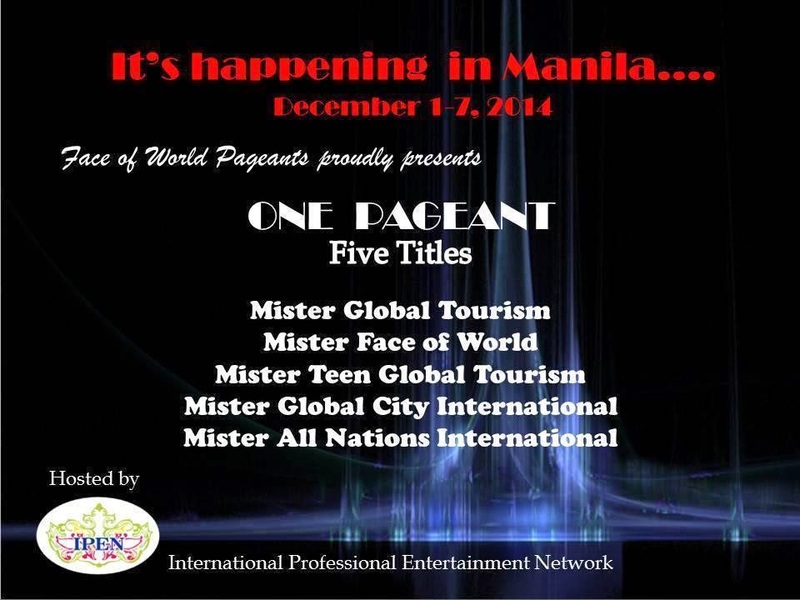 An agreement between Danny's company, MPU (Maharlikang Pilipino USA) and Buchi's FWO (Face of World Organization) was drafted on January 22, 2015; the agreement stated that MPU would be the host and events partner and would be responsible for the following: securing the venue; hiring professional models, glam squad, dressers to assist the models, ushers, photographer, videographer, cleaning crew; providing dressing and styling space, racks and clothes hangers; creating a webpage with thumbnail photos from the show; and publishing program books and press release. It was also agreed that FWO would fund the entire project, and that net sales and profit from the project would be divided in this manner: 70% to MPU and 30% to FWO. Danny signed the agreement, but Buchi did not - which made Danny suspicious of Buchi's intentions. On January 24, 2015, Danny posted on his Facebook page that the UNFW event "has been cancelled" and that he does "not want to deal with them anymore" (them meaning Buchi, Collins and Ovette). Danny officially cut ties with the trio on February 2015. With Danny out of the picture, Buchi, Collins and Ovette are currently promoting UNFW as a week-long project "designed as a glamorous celebration of artistry honoring excellence in fashion" featuring fashion designers from all over the world, as well as consisting of supermodel search, a gala ball, a live charity concert, awards, and other fashion-related events. 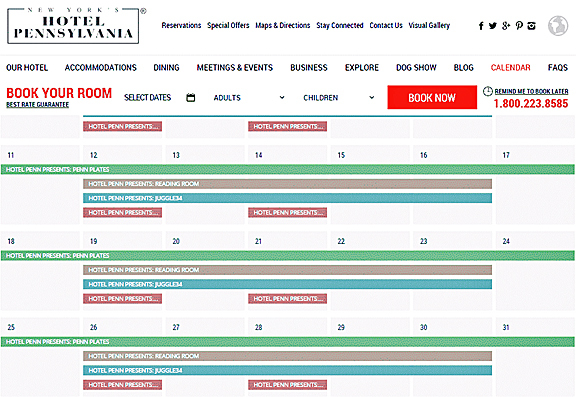 Originally, it was scheduled to be held from August 24 to 29 at the historic Waldorf Astoria Hotel in New York City, but now it has been changed from October 20 to 26, 2015. 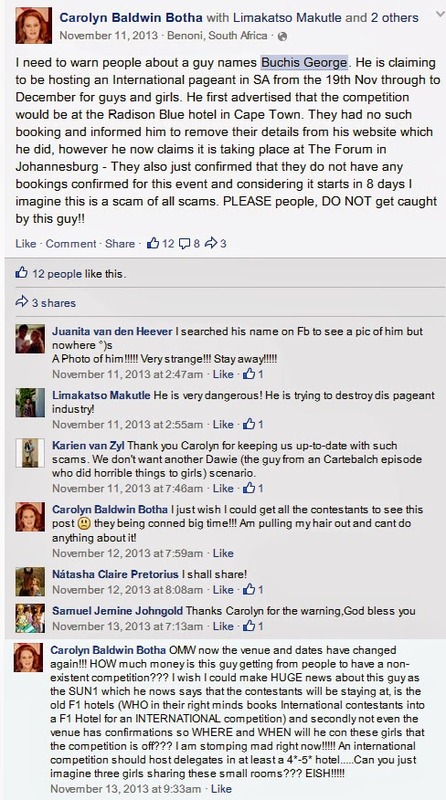 A skeptical Danny met with the Waldorf Astoria events executive on March 11, 2015 who informed him, sure enough, that the October dates have not been secured for the event and that the publicity that Buchi and his accomplices have been posting on social media is completely false. And how laughable is this amateurish logo that infringes on the iconic logo of the United Nations Organization featuring a couple of olive branches? 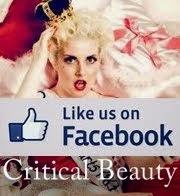 UN teams up with fashion industry to fight poverty (Published by the UN News Centre on June 28, 2012. In collaboration with the Fashion for Development Initiative founded by former Bangladesh-born international model, Bibi Russell). 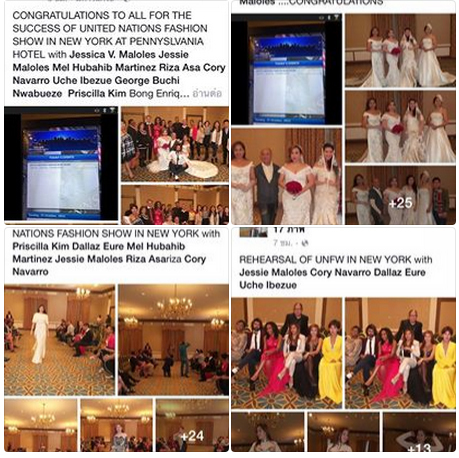 Notice that these fashion shows actually took place at the UN Headquarters, and not at some hotel in New York City. 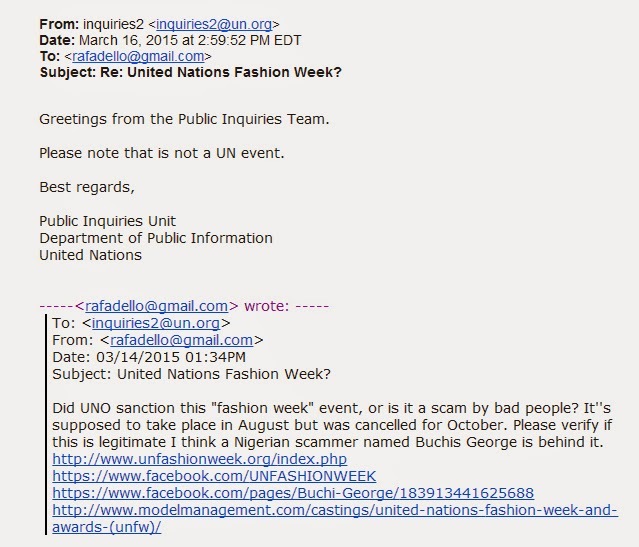 So if UN could deliver fashion shows at its headquarters, why would it hold an October 2015 fashion week at an event space that is not affiliated with the organization? Buyer, beware! 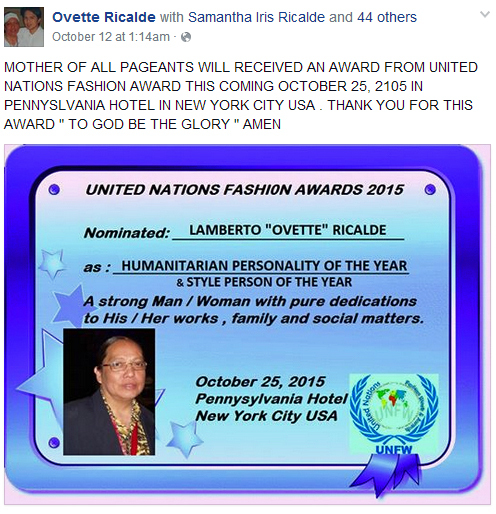 UPDATE: Monday, October 26, 2015: So it seems that Ovette Ricalde did go to New York City and attended the UNFW event but it turned out that it was nothing more than a podunk fashion show held in a room at Hotel Pennsylvania with rooms, without a stage or proper runway, no stage lights, and no banner or signs advertising the event at all. And the models! Ugh! If you can call them models! And as usual, George Buchi was a no-show! Lol! 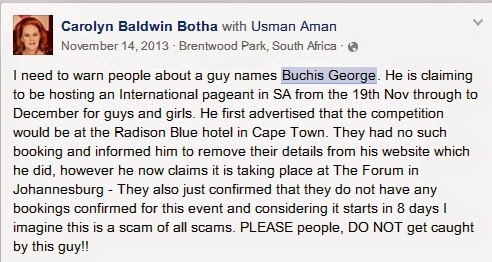 Since I originally posted this exposé on March 14, 2015, Buchis George has changed the hotel venue from the posh Waldorf Astoria Hotel, to the mundane Espace Convention Centre, and now to a bedbug-infested 2-star Hotel Pennsylvania. 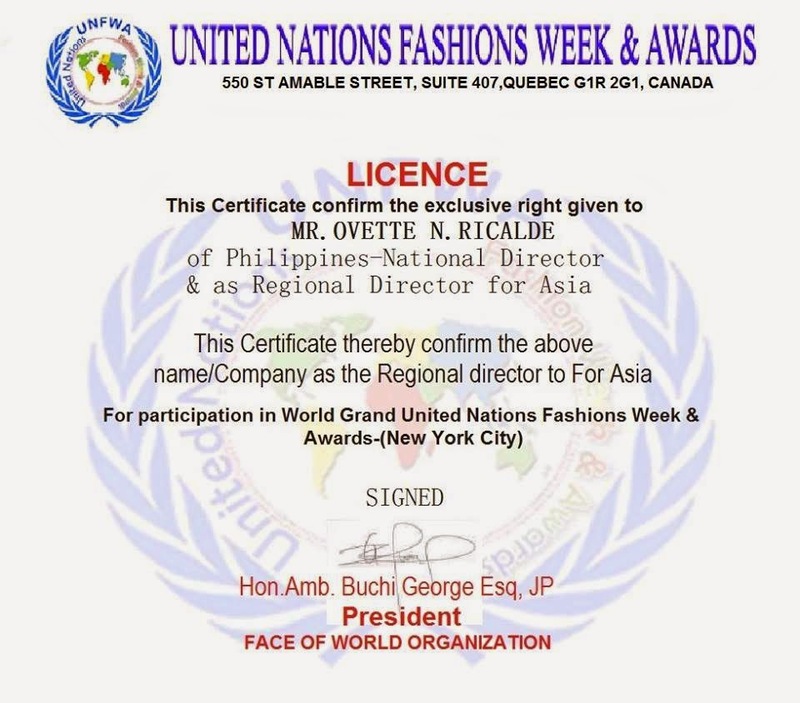 Meanwhile, Buchis's accomplice, Ovette Ricalde, posted on his Facebook that UN will present him with an award as "Humanitarian Personality of the Year & Style Person of the Year." Notice the rather amusing description underneath: "A strong Man / Woman with pure dedications to His / Her works, family and social matters." Whoever created the graphics couldn't even make up their mind if Ricalde is a male or a female. It remains to be seen if Ricalde will actually travel to New York City to receive the award at the fleabag of a hotel. 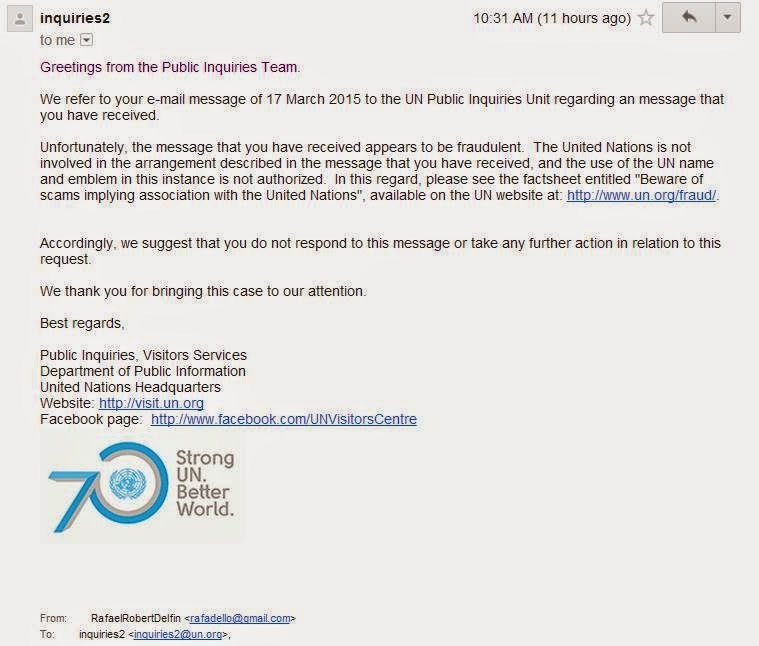 UPDATE: Monday, March 16, 2015: I received a reply from the United Nations Organization regarding my inquiry as to whether or not the UNFW event is sanctioned by UNO. Apparently not!